Over a two year period these pieces were specially crafted for my college guitar ensemble, always a multi-level-ability group of guitarists. 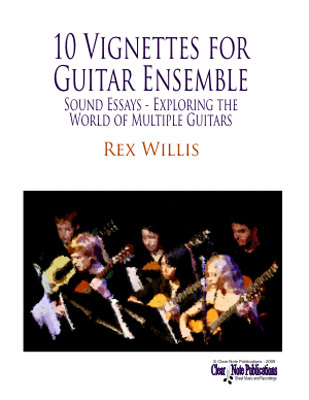 These works allow almost-beginners, intermediate and advanced guitarists to perform together, music designed for the concert stage, all the while teaching them scales, arpeggios and chords, in a variety of rhythmic schemes and styles of music. Several of these works have additional solo parts to be played by an advanced member of the group, or even the teacher/director. I would like to thank my students, both past and present for their many contributions in our rehearsals...you have helped more than you know, in the "working out" process!